The deposit was in the safe, but the safe wouldn’t open. Our church treasurer was on vacation. When he’s gone, it falls to me or the assistant treasurer to secure our deposits in the safe or to remove them and take them to the bank. We normally have a shortcut that allows us to open the cantankerous safe without having to spin through the entire combination. This time it wasn’t working. After several days of unsuccessful attempts, my frustration level was high. Then the treasurer called to say he had to make a quick trip home and would come by and open the safe. I watched as he spun the numbers and noticed one thing he did differently than I had. And that one thing opened the safe. What seemed right to me didn’t work. It didn’t for the writer of this verse either. The way that usually seems right for people to gain God’s approval has to do with works. If I do enough of them, God will let me into heaven. The other popular way concerns morality. If I’m a good person, I’ll get in. The end of these ways—and any other I can drum up—isn’t heaven, but eternal separation from God. Jesus said He was the way, the truth, and the life, and that no one could get to the Father except through Him (John 14:6). Pretty cut and dry. Doesn’t matter whether or not I like it. It is what it is. I can’t make up my own combination and expect the safe to open. Trying to go another way hinders God’s blessings. 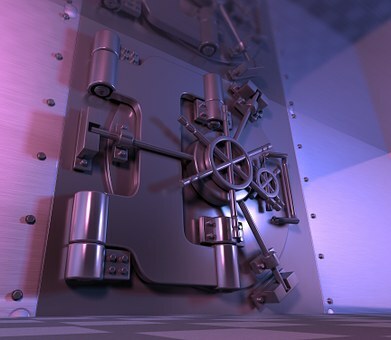 As long as the safe was locked, the blessings of the deposit would not be made into the church’s bank account. Not only will I miss heaven by trying to come some other way to God, but I will also miss blessings and extraordinary living in this life. Attempting another way to God also leads to frustration. The ornery safe had raised mine. Good works, moral living, or anything else I might try won’t fill the God-initiated spiritual void in my life. I’ll be left feeling empty. God’s safe of salvation has only one combination, not many. Put in the correct combination so you can enjoy His best for you now and in eternity. Tweetable: Do you know the combination of God's safe? Prayer: Father, thank You for making the way possible for our sins to be forgiven and our eternity with You to be assured.